Style and sophistication at an incredibly low price! These gorgeous black business card holders feature a sturdy aluminum base with a matt black finish. They can hold 10-12 standard business cards and will keep them in a crisp, pristine condition ready for when you need to present them. The lid of these pocket card cases can be engraved through to a white base, perfect for adding a name, company or brand name or logo, or a marketing message. We offer free engraving of text and logos along with low fixed cost UK delivery. 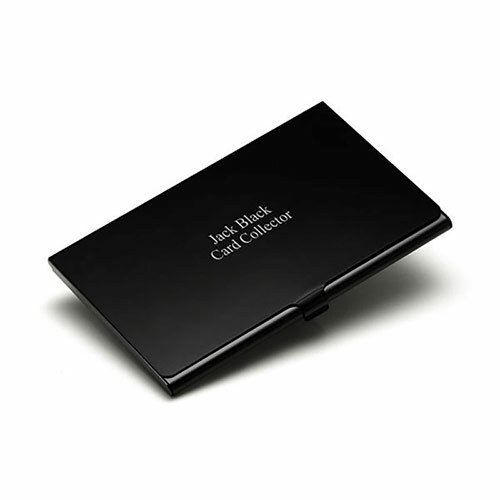 These black business card holders are supplied with a black soft cloth sleeve and black presentation case. Minimum order for these Budget Price card cases is 10 items. For orders over 100, use the Request Quote link (below) to get a custom price. Friday, 12 May 2017 | Mrs. This product looks very good with engraving. It is strong for holding cards and the engraving is very professional. An excellent product that I have no hesitation in recommending.